It’s 9:30 a.m., a cold December morning, and in one of A.C.T. 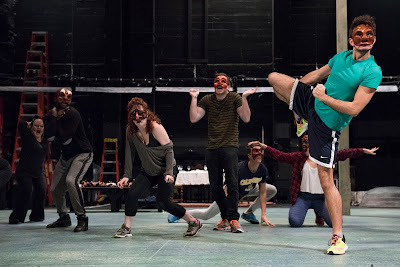 's 8th floor studios at 30 Grant, the second-year Master of Fine Arts Program actors are preparing to show off what they’ve learned in this semester’s Physical Theater class. The Commedia dell’arte masks are lined up on the table. The actors check their props. Upbeat music blares from the speakers. And seated in the front row are two dozen M.F.A. Program actors. As the second years don the visages of old men, young lovers, and dithering servants, their fellow student actors cheer loudly and eagerly provide whatever the improvisations need: encouragement, audience response, even coffee cups. It is moments like this that show how closely knit the Master of Fine Arts Program actors are. No matter how many rehearsals, fittings, readings, and performances they have, they are always there for each other. The winter holidays are traditionally a time to dress up warm. But for Lauren Molina and Nick Cearley of The Skivvies, it’s a time to strip down. In their latest show, The Skivvies: Holiday Roadkill, this award-winning comedy-pop duo literally strip down to their underwear and perform musical mash-ups of all your favorites, like “Baby, It’s Cold Outside” and “You’re a Mean One, Mr. Grinch.” So grab your eggnog and holiday sweaters and join us at The Strand! The Skivvies: Holiday Roadkill will be at A.C.T.’s Strand Theater, 1127 Market Street, on December 22 and 23. Click here to purchase tickets through our website. 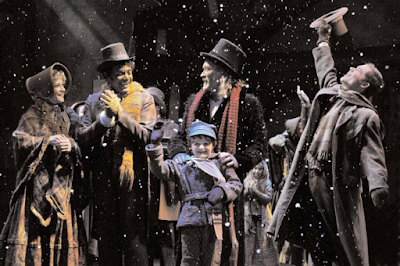 By 2004, A Christmas Carol was 28 years old, and the sets were showing their age. A significant investment would be required to refurbish them, which set Artistic Director Carey Perloff to thinking. Carol had more than served its purpose since 1976. Every year but 1994 and 1995, when the production was put on hiatus until The Geary reopened, many young Bay Area children—and parents—had their first theater experience watching Bill Paterson, Sydney Walker, Raye Birk, or Ken Ruta awake on Christmas morning a changed man. 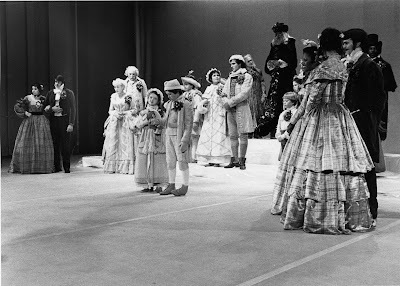 Now, however, Perloff wanted Carol to serve an additional purpose, featuring parts for students in the Young Conservatory, and roles for actors in M.F.A. Program who could add the mainstage experience toward earning their Actors’ Equity union card. 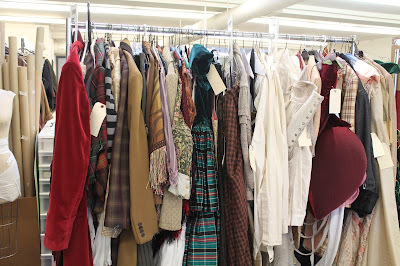 Ever wondered how A.C.T.’s costume and wardrobe departments maintain over 200 costumes during the course of A Christmas Carol? We met up with Costume Director Jessie Amoroso for an inside look into the life of a Carol costume. What is the path of a costume like during the run of the show? Moran—a former student in A.C.T.’s Advanced Training Program (the forerunner of the M.F.A. Program)—is currently performing his two one-man shows The Tricky Part and All the Rage in repertory at A.C.T.’s Strand Theater. On a rainy afternoon, he sat down with current M.F.A. 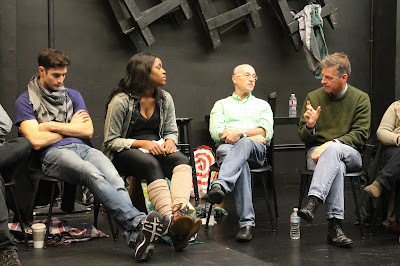 Program actors in The Costume Shop to discuss the thrilling—and sometimes nauseating—process of creating, editing, and performing your own material. Finding Their Voices: DHS Students at A.C.T. In The Rueff, students from Downtown High School (DHS) are pacing back and forth, memorizing lines, and putting up lights in the rafters. After months of preparation and hard work, they are putting the finishing touches on their exhibition, A Mask I Do Not Fit, a collection of original works on topics of gender and identity. Since 2012, A.C.T. has collaborated with DHS to explore educational opportunities through theater. The school’s Acting for Critical Thought project allows the students to learn and discover thought-provoking performances through acting, playwriting, and movement. A.C.T. audiences have taken Martin Moran to their hearts. The Broadway actor and writer opened his repertory performances of All the Rage and The Tricky Part last week, and theatergoers have risen to celebrate him both during the show and in the lobby afterward. To give audiences a better opportunity to talk about the ideas and emotions which Moran’s work generates, we’ve added two Audience Exchanges this week. Moran will follow the performance of All the Rage on Wednesday, December 7 with an onstage conversation with A.C.T.’s Artistic Director Carey Perloff and will follow the performance of The Tricky Part on Saturday, December 10 by speaking with Associate Artistic Director Andy Donald. 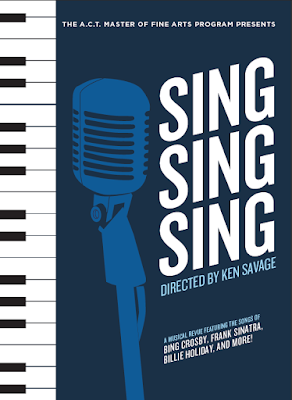 This time of year, the airwaves are filled with classic songs like Bing Crosby’s rendition of “White Christmas” and Vera Lynn's rendition of “I’ll Be Seeing You.” But for Ken Savage, the director of Sing, Sing, Sing—A.C.T.’s Master of Fine Arts Program upcoming music revue—these songs from the 1930s and ’40s are more than just a reminder of the holiday season. They highlight an important shift: in popular music and in the lives of US citizens. "The music of Bing Crosby, Ella Fitzgerald, the Andrews Sisters, Frank Sinatra, Billie Holiday, Vera Lynn, Judy Garland: it’s the beginning of really simple but sophisticated storytelling through music," says Savage. "It’s the best music out there. It’s the music I grew up on. I learned how to sing through it.